The full reveal of Super Smash Bros. Ultimate on Tuesday brought with it some questions. Among them, observers wondered if it was ultimately an enhanced Wii U update with an expanded roster and some new characters. Nintendo's response? Definitely not. "It's definitely not an update," Treehouse localization manager Nate Bihldorff tells USgamer in a conversation during E3. "It's a brand new game built from the ground up. As far as it being a 'sequel,' I don't really think of Smash Bros. games as being sequels, they're just new Smash Bros. games. Everything has been built brand new. Of course you see returning characters and returning movesets, but that's sort of the nature of a fighting game. You obviously want to bring in new players, but you have to satisfy core players. If I'm playing Mario and I don't have a good Up and B, I'm going to be writing my local congressman to get it changed. It's a tough balance, but yeah, it's a brand new game." 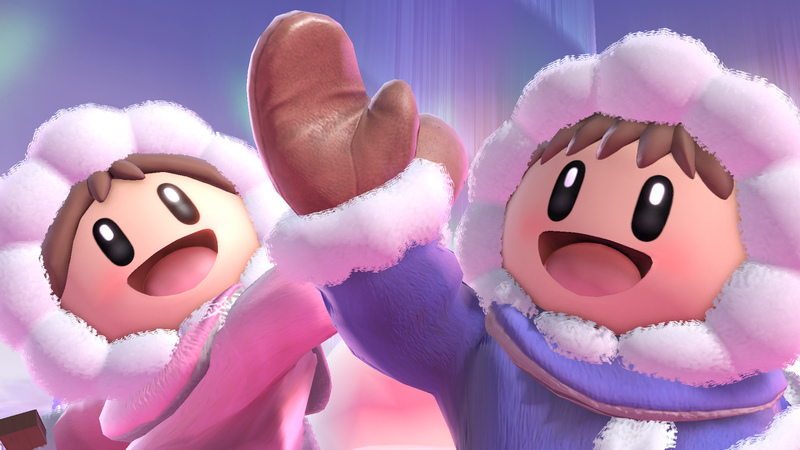 Ice Climbers are returning to Super Smash Bros. Ultimate. Bihldorff says that there have been what he characterizes as "significant upgrades" to elements like the lighting engine and the texture work. He also points to updated characters like Zelda, whose look is now based on A Link Between Worlds. "True to form, I'm sure [Masahiro] Sakurai sat down with the original artists from that game and said, 'What are we gonna do about that necklace, how do we want her gown to look?' Those details are just everywhere. And that's just purely from a visual standpoint." Bihldorff says he understands that stages returning from the Wii U version look superficially similar, but he says there are differences. "When you're bringing back stages, especially when you look at a stage from the Wii U version which was already in HD, at first glance it's going to be a little bit similar. That's when you need to go to the next level and look at lighting, how the players are interacting. Beyond the changes, I can't count the number of small changes. I don't think it's hyperbole when Mr. Sakurai said that there were tens of thousands of changes compared to the last game." 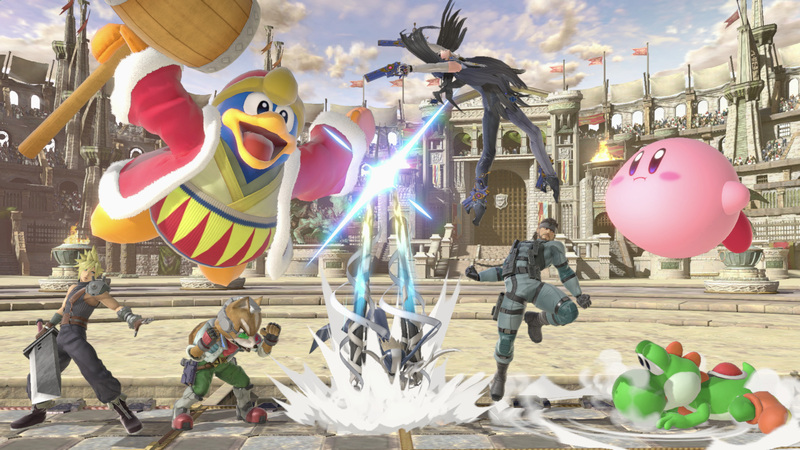 In addition to the visual changes and new characters, Smash Bros. has a handful of new and returning mechanics, including a new short hop attack shortcut and a directional air dodge. Talking about yesterday's Smash Bros. Invitational 2018 Tournament, Bihldorff says he already saw new techniques emerge among the pro set. Asked for an example, he elaborates, "There was a moment where, in the finals, MkLeo got the Dragoon and targeted ZeRo. [ZeRo] did an air dodge to another platform just as the Dragoon was triggered, and because he landed perfectly on the platform, he was able to do a ground dodge as the Dragoon went by and it missed him." "Dash-dancing"—an advanced technique from Super Smash Bros. Melee in which you rapidly tap the analog stick back and forth to cancel out dash animations—appear to be back as well, Bihldorff says. "I picked up the controller today and tried to do the same thing and I was doing it." He concludes, "I fully believe that when [Smash Bros. Ultimate] comes out, the pro community is going to grab onto it and show me stuff I've never seen before even though I'm in development. I think it's going to be good. Core, casual, I think they're all going to love it." From my own standpoint, Smash Bros. Ultimate definitely has some nice enhancements, including new transition and victory scenes. The real proof, though, will be in the single-player content. Will Subspace Emissary return? Will there be a new mode? Will challenges be updated? And how many more new characters will be announced? Bihldorff wouldn't speak to any of those elements (sorry), but we'll know soon enough. In the meantime, with new characters like Inkling and Ridley joining the fray, balance changes across the board, and mechanical updates, Smash Bros. Ultimate does a fair amount to differentiate itself. But we'll have a clearer picture of Smash Bros. Ultimate as more announcements are made throughout the year. Super Smash Bros. Ultimate is out December 7, and will include some sweet new amiibo. Go here to find everything we know about Super Smash Bros. Ultimate so far. Tagged with E3 2018,	News,	Nintendo,	Nintendo Switch,	Smash Bros.